I spent the last week in Las Vegas at UFC 196, finally getting a chance to size up the sport and its protagonists up close. It is fascinating, brutal and very much here to stay. With the certainty that the odds-makers front of house at the MGM would agree, the best outcome at UFC 196 was what eventually transpired – Miesha Tate choked out Holly Holm, Nate Diaz did the same to Conor McGregor, and all of a sudden the UFC is on the verge of truly breaking into the mainstream. Long derided as the “human cockfighting” of John McCain’s memorable yet erroneous description, the addition of the revelation that McGregor is human to the bonfire of the vanities that already contained the ashes of Ronda Rousey’s invincibility has turned the sport into an irresistible force. Had McGregor won, his juggernaut would have rolled on, crushing every weight class in his path. Instead, he faces a steady diet of humble pie as he slims down to featherweight to defend the belt still in his possession. Similarly, Holly Holm’s short-lived sojourn as bantamweight champion that came to an end in Tate’s grip opens up the kind of intrigue that the UFC could only have dreamed of at the start of the week. There are now three women in the bantamweight division with little to separate them and plenty of scores to be settled. Whatever way the fighters are matched up for UFC 200 and beyond, it is a fascinating prospect. The victory of Nate Diaz, a junkyard dog with a head like an anvil, over McGregor exploded across the UFC. The divisions of featherweight, lightweight and welterweight went from being a Notorious one-man show to a kaleidoscope of names all vying for a piece of the action. And therein lies part of the problem. Until Saturday Diaz was a journeyman from Stockton without too many decent paydays to his name, and now all of a sudden he is another millionaire at the top of the pile. In the shadow of the shimmering gold facades of the Mandalay Bay and Trump’s Casino there is substance abuse, homelessness and poverty. On East Tropicana Boulevard, opposite where the Lincolns and Suburbans of wealthy fight fans pull in to park at the MGM, is a vacant lot where winos gather, seeking out a scrap of shade for somewhere to hide from the scorching sun and drink. All of happens a stone’s throw across the street from the grandeur of the Grand, where a select few fighters – Diaz now among them – can make millions from half an hour’s work. But the peculiar Las Vegas dichotomy between splendor and deprivation is also reflected inside the octagon, where there are those of great riches like McGregor and those struggling to get by. Further down the card, the fighters train and toil and battle for a relative pittance, scrambling to get a foot on the slippery, elusive ladder to the top of the UFC. The lucky ones will get a sum in the low five figures for fighting, most of which will be sucked up by their costs. Sweden’s Ilir Latifi fought a tremendous bout at light heavyweight, but I sincerely doubt that his haul from the sellout event will have the private bankers beating a path to his door in Rosengård to advise him on his future investments. And perched above them all is McGregor with his seven-figure cheque just for showing up, and a shop out in the lobby doing a roaring trade in t-shirts featuring his name and image. 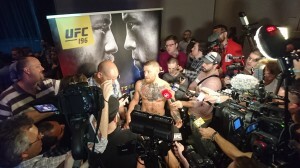 McGregor is often criticized for his attitude towards money, and his inference that wealth brings with it both style and class, when in fact it often hinders the development of both. McGregor’s attitude is reminiscent of the bling of hip hop and Vegas itself, where your value is measured based on the size of the stack in front of you, rather than your game. It might be vulgar, but it is the reality of the way and the city and the sport in which he made his name. Wealth, cars, freedom – such are the privileges of being the engine of growth of sport in general and the Ultimate Fighting Championship in particular. You get to call the shots. Earlier in the week McGregor claimed with the blustering certainty that only he can muster that he would break the billion-dollar turnover barrier for the UFC. In truth it didn’t matter whether he won or lost on Saturday – if there’s one thing Las Vegas loves more than a celebrity winner, it’s a high-stakes loser. The whole city is built on the shaky premise that losing is not the end, that you can win it all back in one glorious moment if you just have the courage to double down. Redemption is on offer, twenty-four hours a day. Rumours of the demise of McGregor and Holm, are greatly exaggerated. They are still great fighters and even though they are now back among the ranks of the contenders (McGregor still holds a belt, but he is a contender at lightweight and welterweight), they are far from done. Atop all of this is the UFC, an organization struggling to deal with the growing pains as the sport’s acceptance in the public consciousness gathers pace. Though capable of slick in-house video and no stranger to a well-staged announcement, its press operation is lamentably overrun, a fault which limits the spread of news from the UFC to non-fight fans. “The company”, as it is known, was also briefly at risk of a not-so-hostile takeover by McGregor, who spoke of creating his own belt and made himself an equal of Dana White as the kingpin of the UFC looked on sheepishly, unsure of whether to embrace McGregor or slap him down. In the end Diaz did it for him, dealing decisively with the threat of McGregor’s burgeoning popularity and ego – for now, White once again holds the whip hand ahead of UFC 200. And instead of one big name, he finds himself in command of a roster of fighters that has captured the imagination of the public and that is gradually seeping from the online sites that nurtured it all these years onto the back pages of the more respectable broadsheets. For fans, it’s an easy choice and it is their interest which has seen the papers adopt he sport. Professional boxing is dull and uninspiring – the heavyweight bout between Wladimir Klitschko and Tyson Fury was an insufferable yawnfest, and the most interesting aspect of any meeting of Mayweather and Paqcuiao is to see who can come off as the more reprehensible character. Not so the UFC. There are plenty of pantomime villains here too, but put simply, there are so many ways to hurt an opponent that a lot more usually happens than in simple stand-up boxing. Unfamiliar with the finer points of Jiu Jitsu, the casual observer may not always understand what is happening when a fight goes to the mat, but there is usually no shortage of spectacular blows from hand and foot, and a fair dash of crimson in many contests too. The tension as Holm and Tate circled each other looking for an opening was also as beautiful and explosive a choreography as you will see in any fighting sport, a mix of fine footwork, feints and menace that equaled anything you’d see in a boxing ring. But most of all the narrative follows the classical Greek tradition; we have heroes and villains, all on various stages of their journeys, all with obstacles between them and their goals. The visceral nature and often immediate gratification offered by mixed martial arts makes it the sport of our time. It is at once honest and deceitful, rich and destitute, beautiful and brutal. And the UFC is its flagship. The future of the company itself is undecided – it may well grow to be a financial sporting juggernaut, and it may yet drown in a pool of its own greed and incompetence. Either way, the sport of mixed martial arts will continue to survive and thrive, and fans will continue to flock to it in their droves. Forget the money, and the allegations of steroid use, and the endless trash-talking – when that gate closes and it’s one against one, and the blows start to rain down and the blood to flow, there is currently nothing as dirty or as pure anywhere in the sporting world. This entry was posted in Uncategorized and tagged Conor McGregor, Dana White, Holly Holm, Miesha Tate, mixed martial arts, MMA, Nate Diaz, Ronda Rousey, UFC on March 9, 2016 by admin.